Not much to talk about in this post, dear neighbor, just a very simple winter salad where I sneak in raw vegetables for my Finicky Eater, aka my dear husband, and I figured, well, if it works for him, maybe it will work for you and your own finicky eater, children, whatever ! How is it done ? Simply by using a julienne knife to cut the not-so-well-liked vegetables, namely beet and black radish, into very thin strips. It looks pretty, and apparently is more pleasing to the taste buds than grating the vegetables, which is what I had been doing up until now. The culinary world is full of surprises, isn’t it ? 2. Wash and prepare the greens. 3. Peel the beet and radish. Cut into long strips using a julienne knife. 4. Prepare the dressing by mixing miso paste first with vinegar then sesame oil. 5. 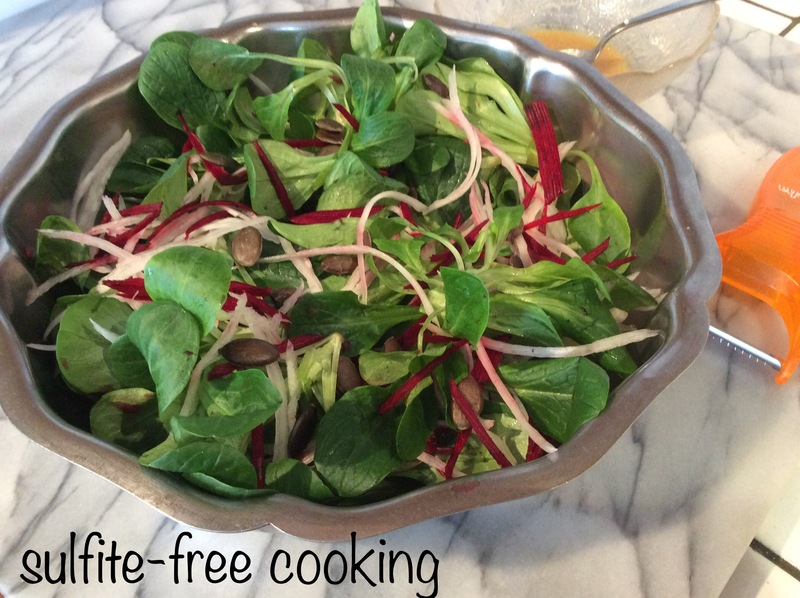 Toss everything in a salad bowl, and enjoy! This one was taken on the island of Odaiba. A pretty floral arrangement at the entrance of a museum. After we left there were a couple of snowy days in Japan. We saw it in the news and it was a real shock to recognize all the places ! I wonder what happened to the flowers on the tree, but snow in January is better than frost in April, isn’t it ? The salad is pretty standard in my house, but the dressing is new to me and sounds delicious. Something to try! Gorgeous photos, dear Joelle, especially the “cauliflower flowers”! Thank you Dolly! I came up with this dressing a while back, last summer I think, and given its huge success at home have been making it over and over. Japan was a lovely place, even more so as it didn’t make my husband sick. And apparently it’s pretty standard: someone whose husband also suffers from sulfite allergies just told me that they spent three weeks there two years ago, and no problems either! It is really a shame I don’t speak Japanese. I am very tempted to learn it now! I am very happy to hear that both you and your husband had a good time in Japan! Enjoying food without fear of allergy-related discomforts is part of a successful trip!